It’s ironic that the iPod Shuffle–such a teeny tiny piece of design goodness–can feel unbearably huge sometimes, when you factor in that annoying headphone cord that’s always whipping around. Clipping the Shuffle to your collar doesn’t really get rid of the cord–it just makes a big lasso for catching onto stuff. 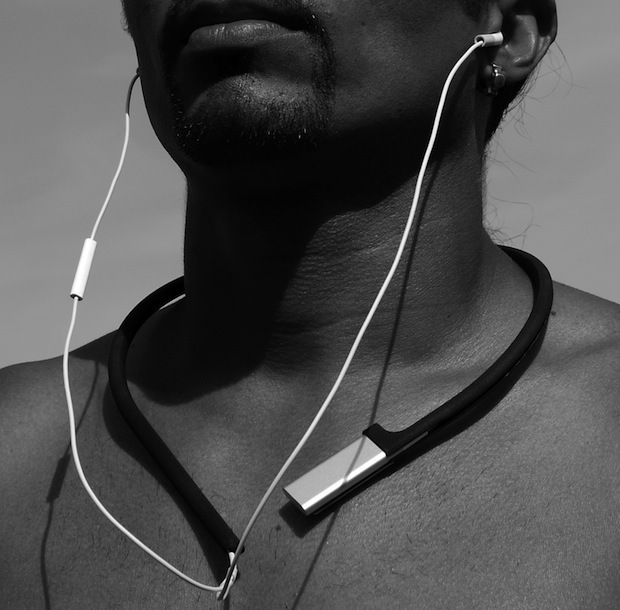 As Cornelissen puts it, “The easiest way to wear your music – even if you’re not wearing much.” The one flaw we can see is that the thing would be perfect for running–if only you could clip it down. (But maybe wearing it under your shirt suffices?) Anyway, it’s definitely great for the gym, biking, and whatnot. Cornelissen sells the gadget directly through his website. Some of his other cute knickknacks include an attachment for making icosahedrons from pencils; and a necklace that doubles as a multi-tool.